As a freelance writer, I’m in a ton of Facebook groups where we share our Facebook page links. And I’ve found a few prospective clients that way. Usually, the page administrator will create a weekly post asking everyone to share a link to their business. These link-shares are a great way for freelancers, coaches and speakers to get found by new clients. But all too often the links people share are missing pertinent information. And sometimes I get on the prospect’s FB page and hit a dead end. They’re a coach, but there’s no clear way to connect with them further. Remember, your potential clients may need several points of contact with you before hiring you. And Facebook pages aren’t the most direct communication route. So make sure your Facebook page leads them to other ways they can connect with you as well. 2. Make your Page’s cover pic informative. Include your biz name, what you do and contact info for a better preview. If people are scrolling through a post of 100+ links, make it easy to find what they’re looking for. Kamila of Journey To Launch has a wonderful Facebook cover. She uses her lead magnet (a free email course on how to save money) as her cover image. Change your Facebook button to correspond to your offer using the box with three dots next to the button, and you’re all set. With this method, when you post your link in a comment, your full cover image, which appears when someone hovers over the link, will give enough detail to entice your prospective clients to click. And they won’t have to dig for information. 3. Include links to your other social media profiles in your About section. Facebook’s default setting gives you space for your website and email address. To add Twitter (if you choose) and LinkedIn (always!) just edit your contact info and click the “add account” button. LinkedIn and Twitter are my faves, so I always connect with people through their links. If your Instagram is personal pics only, it’s ok to skip it. But I’d urge anyone in a visual business, like design consultants, to link your Instagram too. 4. Make sure to include your email address also. I know this seems obvious, but you’d be surprised how many coaches forget to add their contact info or website link to their page. Dead end city. By the way, my Twitter feed is pretty cool; you should follow me! A clear, informative Facebook page is crucial for coaches and speakers today. 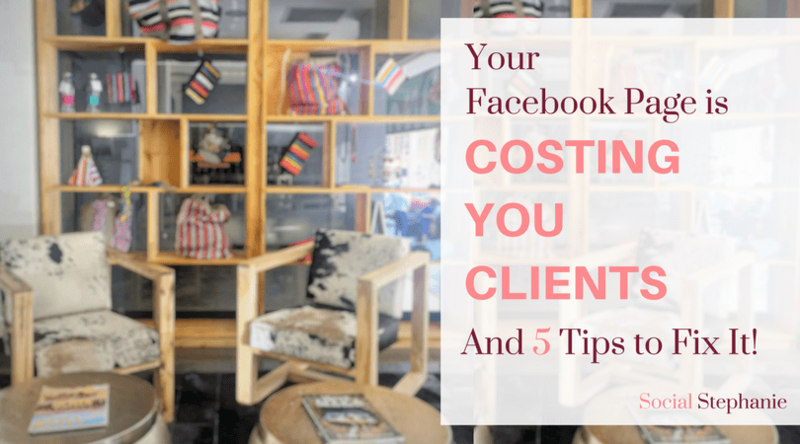 These 5 tips will have clients finding YOU. Which of these tips helped you the most? Let me know in the comments. Happy networking! Helping coaches master content marketing. As a freelance writer, I write case studies, blog posts and books for coaches on topics that include personal finance, empowerment and spirituality.